Truthfully, there are lots of reasons why buying skincare from your doctor can be a much better and less complicated way to choose the right products for your skin. Take a look at these top ten reasons why you should buy skincare from your doctor instead of the drug store or online. Your skincare regimen should be custom-tailored to meet the unique needs of your skin type. Most people do not accurately assess their skin type on their own, so working with your doctor to figure out which of the 16 Baumann Skin Types® you are and then create a customized skincare plan can help you see the best results. When you buy skincare right from your doctor’s office, you can avoid the hassle of going to your doctor’s appointment, then to the drug store, then to a speciality beauty store to find what you need for your skin. Physicians who use the Skin Type Solutions system provide you with all the products you need, as well as an easy-to-follow instruction sheet that is customized just for your skin type. 4 years of medical school where they learn pharmacology, anatomy, and each biologic system in detail such as cardiovascular, pulmonary, renal, hepatic, etc. 3 years of dermatology residency – focused on the study of skin, hair, and nails. In addition, some dermatologists complete another year or two in subspecialty training such as cosmetic dermatology, pediatric dermatology, MOHS surgery, or dermatopathology. 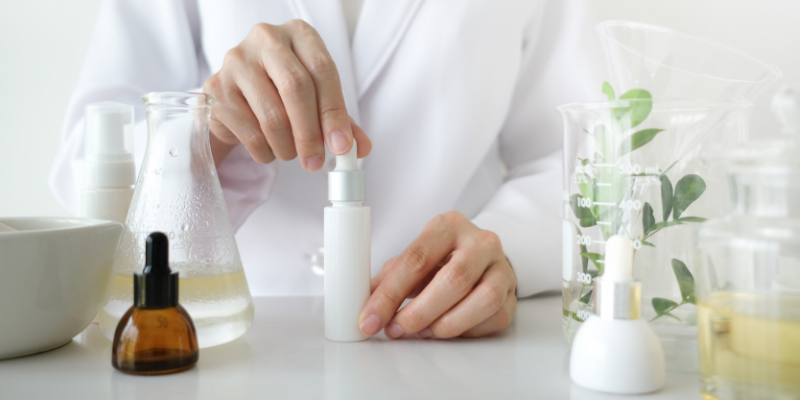 I bring this up because cosmeceutical science is so complicated that it requires years of study on ingredient chemistry, penetration technologies, skin science, and body physiology to be able to understand it. Here are some examples of things you need to know to properly prescribe a skincare regimen: Some skincare ingredients do not work well with others, and some need to be applied in a particular order to maximize their effectiveness. Understanding which ingredients to combine and which to separate into a morning and evening routine requires a good understand of ingredient interactions, pH, and skin barrier function. Retinoids, for example, break down upon contact with light and should be used in the evening regimen but not the morning regimen. Vitamin C is a finicky ingredient that works best when the pH of your skin is slightly lowered. There are many facts like this that must be considered when designing a skincare regimen. Some products such as Zerafite moisturizers, medical-grade cleansers, and prescription treatments are only available through your doctor. Using the correct physician-dispensed products for your skin type can often help you see better results. More and more fake and counterfeit beauty products are surfacing online and even in some major big-box retailers. The best way to protect yourself from unknowingly purchasing fake or illegal beauty products is to buy them directly from your doctor. One of the biggest red flags of fake skincare products is a low price that seems too good to be true. Using the wrong ingredients can have a detrimental effect on your skin’s health and appearance, but if you’re not sure which ingredients to avoid based on your skin type, selecting skincare on your own can be challenging. Additionally, if you buy skincare online, there is a chance that “copycat” products could contain toxic or otherwise harmful ingredients. Generic copycat products are not the same as their brand-name counterparts, even though the ingredient list on the label might be identical. The order in which each ingredient was added to the formulation when the product was made plays an important role in the final product. Your board-certified dermatologist can recommend products that have been properly formulated for maximum effectiveness and minimal side effects. You have a busy schedule, so why waste time hopping from store to store trying to find the right beauty products when you can get them directly from your doctor before you leave his or her office? Yes, you can actually save money when buying skincare products from your doctor. Check for special promotions from your doctor’s office, and stock up on the products you use every day. Secondly, high-end products from beauty stores can be expensive, but they are not necessarily the right products for your skin’s needs. Your doctor can help you create a regimen that is right for your skin and that is worth the money. Buying skincare from your doctor gives you the opportunity to ask questions about how and when to use each product and how to minimize any side effects. You will ultimately see the best results when you purchase the right products for your skin type directly from your doctor and understand the most effective order and frequency to use them. Schedule a follow up in a month so that your regimen can be adjusted as your skin improves. To make sure you are using the right products in the right formulations and seeing the best results, it is better to buy skincare from your doctor rather than online or from a department or beauty store. If you would like to find out which Baumann Skin Type® you are and receive a customized skincare plan based on the unique characteristics of your skin, find an STS approved physician in your area to get started, or give our Miami office a call at 305-532-5552.